Hot off truck, buy it now! Look out, here comes the Spider-Spud! Peter Parker looks a little more like Potato Parker with this rotund superhero toy. With all the parts you need to make Marvel's most famous hero-- as a side dish-- the Spider-Spud provides much-needed potato fun to fans of all ages. When a radioactive spider bit Peter Parker Potato, he became SPIDER SPUD! With eyes for trouble, this web slinger uses his starch-strength to mash out evil and save the day! 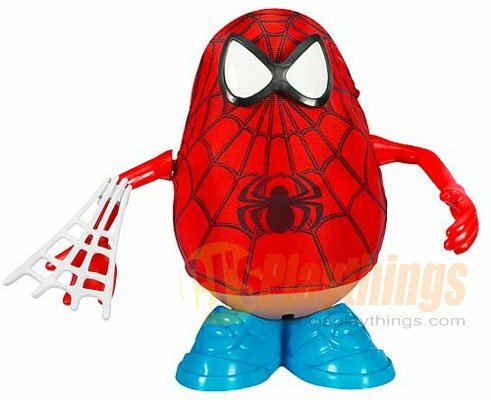 Dress the potato you love as your friendly neighborhood SPIDER SPUD hero or Peter Parker Potato! You can even mix and match all the parts to create your own wacky looks! Super Hot Toy! Sold out in stores! Great for your Spider-man collection or present!